Former Pitt wrestling head coach Rande Stottlemyer’s career includes a 304-231-12 record, making him the winningest coach in the program’s history. When former Pitt track and field coach John Vasvary first came to Pitt, he was looking for someone to help him find his way. Help came quickly from Rande Stottlemyer. The University of Pittsburgh lost the staple of its wrestling program last Sunday, Jan. 28 when Stottlemyer, a former wrestler and longtime wrestling head coach, died at 62 due to complications of early onset Alzheimer’s disease. Over the course of his many years as a student-athlete and coach at Pitt, Stottlemyer embodied the ideal values of the City in which he resided — a strong work ethic, a humble attitude, and a blue-collar mentality, which defined his time at the University. Stottlemyer brought many of the same values to coaching that he applied in his family life, where he was known as a loving husband and father. He is survived by his wife of 35 years, Regina Carson Stottlemyer, and their four daughters — Tara Stottlemyer, Rebecca Bergstedt, Jaclyn Royall and Kelsey Pust. Vasvary also contemplated how Stottlemyer — or “Stotty,” as he was often known among friends — will be remembered. Stottlemyer’s wrestling career began at Hickory High School in his hometown of Hermitage, Pennsylvania, about a 90-minute drive north of Pittsburgh. He never lost a dual meet during his four years in high school, and he finished as a Pennsylvania Interscholastic Athletic Association state runner-up and a two-time Junior National Freestyle Champion. Stottlemyer was a 2013 Mercer County Hall of Fame inductee for his accomplishments. After graduating from high school, he chose to wrestle for Pitt — a place that would become his home for the next 40 years. He enrolled at Pitt in 1974 and wrestled under head coach Dave Adams from 1974 to 1978. Stottlemyer competed in the inaugural Eastern Wrestling League Championships in 1976, capturing the 134-pound title. By the time he graduated with a degree in physical education, Stottlemyer was Pitt’s all-time winningest wrestler, compiling a record of 68-16-2. He finished his productive athletic career as a four-time NCAA qualifier, two-time EWL champion, a three-time NCAA All-American and as a team captain for the Panthers. 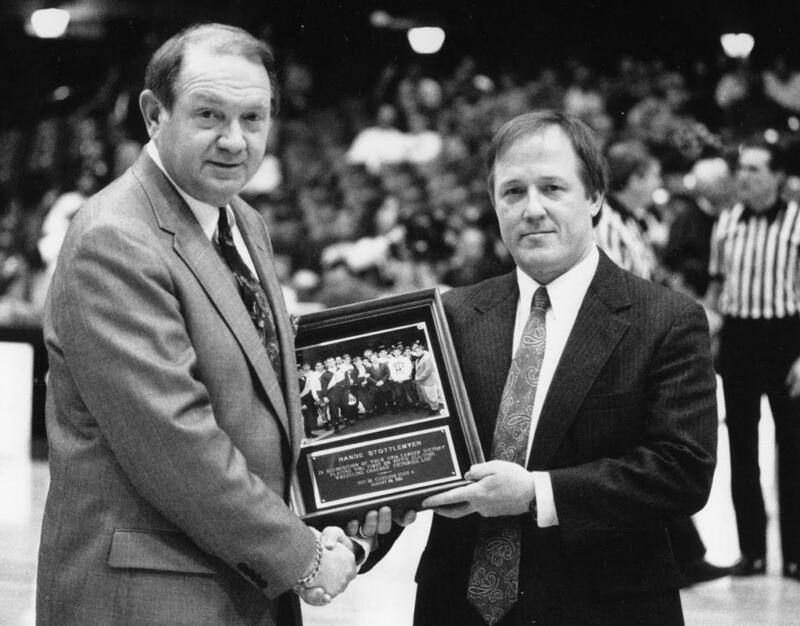 Adams retained Stottlemyer for an assistant coaching position, a job he held for just one year before Adams stepped down as head coach after the 1979 season. On his way out, Adams recommended that the school hire Stottlemyer as his replacement. His wish was granted, and Stottlemyer became the head coach of the Pitt wrestling team in 1979, at the age of 24. From there, he embarked on a coaching career that spanned generations, influenced countless lives and developed the University’s wrestling program into a perennial force at the national level. His illustrious, 34-year coaching career included a 304-231-12 record, making him the most successful coach in program history. Stottlemyer produced 56 EWL individual champions, 33 All-Americans and three national champions. In particular, the final four years of Stottlemyer’s head coaching tenure rank among the program’s finest. The Panthers won three EWL regular-season championships (2010, 2011, 2012) and three EWL Tournament titles (2011, 2012, 2013) during that span. Pitt placed 15th in the nation in each of his final two seasons as head coach. In addition to his teams’ success on the mat, Stottlemyer also stressed hard work in the classroom. Two of his athletes — Greg Zimmerman and John Withrow— were awarded the University’s prestigious Omicron Delta Kappa award, presented annually to the outstanding senior student at Pitt. In 2006, his team captured the University’s Scholar-Athlete Academic Cup, also presented annually to the athletic team with the highest GPA. Coach Stottlemyer was highly respected and well-liked among his wrestlers, who will remember him for his kindness, passion and mentorship.